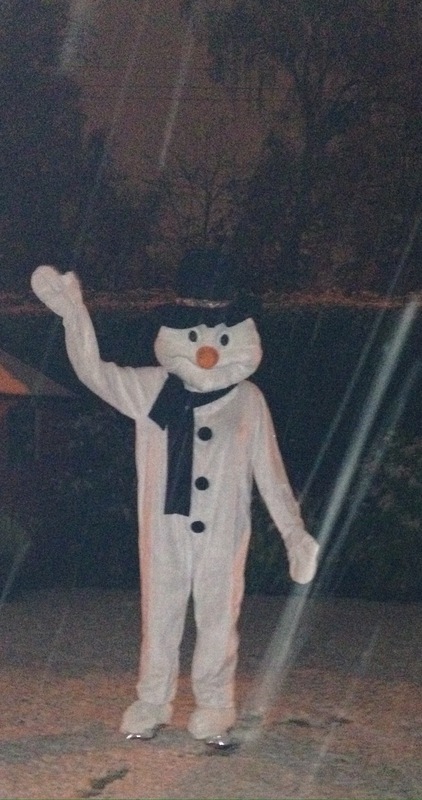 As the temperature dropped this week and the first snow of the season fell, there was a sighting of Burnside Primary’s Christmas Fayre Snowman mascot ahead of the big day on Saturday 26th November. However, while mascots like Clyde, Broxi, Pride and Hoopy are well-known, Burnside’s big friendly mascot is nameless…for now. Burnside Primary’s Christmas Fayre team are asking pupils and parents to choose a name of the snowman who will play a starring role at this year’s Fayre which takes place at the school at its decant building on Lochlea Road, Rutherglen on Saturday 26 November between 11.00am-2.00pm. Some early name suggestions for Burnside’s Snowman mascot include Sam, Burny, Walter and Silly Bertie while Frosty has been ruled out as too predictable. Everyone who votes for a mascot name or suggests a new one, will be entered into a prize draw with one lucky winner taking home Odean cinema tickets for a family of four. Parents and pupils will be invited to vote online by the Burnside Parent Council in the coming weeks. The Fayre is a key event in Burnside Primary’s fundraising calendar and this year the school will be transformed into a winter wonderland with a special snow-theme to children’s games including ‘Hook A Snowman’, ‘Snowball Throw’, ‘A Snowman Treasure Hunt’ and ‘Ski Jump contest’, amongst others. With just over two weeks to go, preparations for Burnside’s Christmas Fayre are well underway. There will be stallholders selling festive treats, a pre-loved stall with fancy dress items and school uniforms, raffles for adults and children, tombola, games and, of course, Santa’s Grotto. And if it’s cold outside, visitors can tuck into a bowl of homemade chilli nachos to heat themselves up and there will be a Tearoom offering tasty treats and delicious homemade baking. This year also sees the return of the hugely popular Burnside Bake-Off which, for the first time, will see little bakers get in on the cakey fun as they compete to be crowned the ultimate Burnside Baker. This will be the last year Burnside Primary’s Christmas Fayre will be held at their decant building on Lochlea Road, Rutherglen as the school prepares to return to its old address in Glenlui Avenue in 2017. Work on Burnside’s new school building started in June 2015 and the new Burnside Primary is expected to open its doors to pupils and staff early in the new year. Headteacher Helen McGarvey says: “The Christmas Fayre countdown has begun and there’s a great buzz about the school as pupils excitedly prepare for the big day. The Christmas Fayre is the biggest event of the year where we throw open the school doors and welcome the community in for some festive fun. Burnside Primary’s Christmas Fayre takes place on Saturday 26 November between 11.00am-2.00pm. Entry is £2 for adults while children go free.